cron(8) is a daemon that runs a command or script on a regular schedule as a specified user. Typically, the user who wishes to schedule a task manually creates a crontab(5) using syntax that can be perplexing to new Unix users. The FreeNAS® GUI makes it easy to schedule when you would like the task to occur. due to a limitation in FreeBSD, users with account names that contain spaces or exceed 17 characters are unable to create cron jobs. Figure 6.1a shows the screen that opens when you click Tasks ‣ Cron Jobs ‣ Add Cron Job. Table 6.1a summarizes the configurable options when creating a cron job. Created cron jobs will be listed in “View Cron Jobs”. If you highlight the entry for a cron job, buttons will be displayed to “Edit”, “Delete”, or “Run Now”. 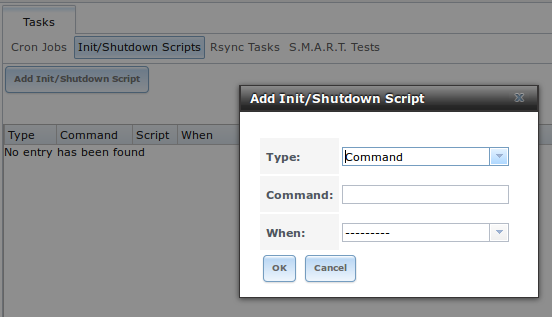 Figure 6.2a shows the screen that opens when you click Tasks ‣ Init/Shutdown Scripts ‣ Add Init/Shutdown Script. Table 6.2a summarizes the available options. When scheduling a command, make sure that the command is in your path or give the full path to the command. One way to test the path is to type which command_name. If the command is not found, it is not in your path. Rsync is a utility that automatically copies specified data from one system to another over a network. Once the initial data is copied, rsync reduces the amount of data sent over the network by sending only the differences between the source and destination files. Rsync can be used for backups, mirroring data on multiple systems, or for copying files between systems. FreeNAS® can be configured as either an rsync client or an rsync server. The opposite end of the connection can be another FreeNAS® system or any other system running rsync. In FreeNAS® terminology, an rysnc task defines which data is synchronized between the two systems. If you are synchronizing data between two FreeNAS® systems, create the rsync task on the rsync client. rsync module mode: exports a directory tree, and its configured settings, as a symbolic name over an unencrypted connection. This mode requires that at least one module be defined on the rsync server. It can be defined in the FreeNAS® GUI under Services ‣ Rsync ‣ Rsync Modules. In other operating systems, the module is defined in rsyncd.conf(5). Figure 6.3a shows the screen that appears when you click Tasks ‣ Rsync Tasks ‣ Add Rsync Task. Table 6.3a summarizes the options that can be configured when creating an rsync task. If the rysnc server requires password authentication, input –password-file=/PATHTO/FILENAME in the “Extra options” box, replacing /PATHTO/FILENAME with the appropriate path to the file containing the value of the password. Created rsync tasks will be listed in “View Rsync Tasks”. If you highlight the entry for an rsync task, buttons will be displayed to “Edit”, “Delete”, or “Run Now”. 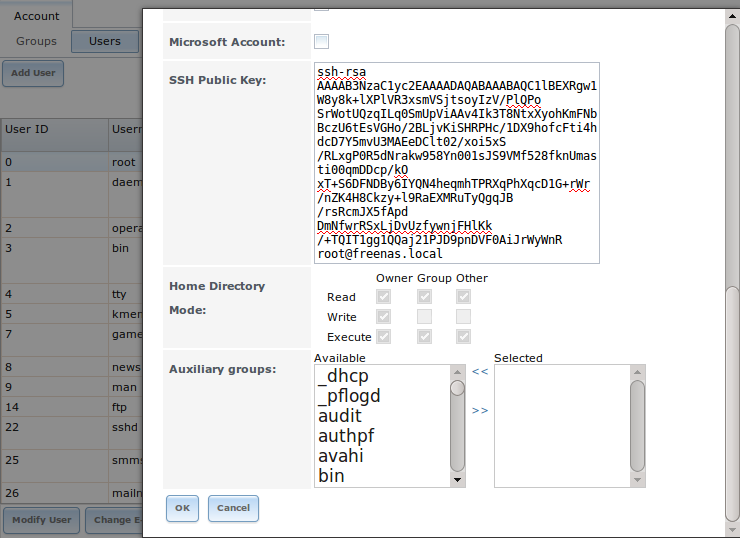 FreeNAS® supports the following types of SSH keys: DSA, and RSA. When creating the key, specify the type you wish to use or, if you are generating the key on another operating system, select a type of key the key generation software supports. Go to PULL and paste (or append) the copied key into the “SSH Public Key” field of Account ‣ Users ‣ View Users ‣ root ‣ Modify User, or the username of the specified rsync user account. The paste for the above example is shown in Figure 6.3b. When pasting the key, ensure that it is pasted as one long line and, if necessary, remove any extra spaces representing line breaks. Once you save the rsync task, the rsync will automatically occur according to your schedule. In this example, the contents of /mnt/local/images/ will automatically appear in /mnt/remote/images/ after 15 minutes. If the content does not appear, use Shell on PULL to read /var/log/messages. If the message indicates a n (newline character) in the key, remove the space in your pasted key–it will be after the character that appears just before the n in the error message. S.M.A.R.T. (Self-Monitoring, Analysis and Reporting Technology) is a monitoring system for computer hard disk drives to detect and report on various indicators of reliability. When a failure is anticipated by S.M.A.R.T., the drive should be replaced. Most modern ATA, IDE, and SCSI-3 hard drives support S.M.A.R.T.–refer to your drive’s documentation if you are unsure. 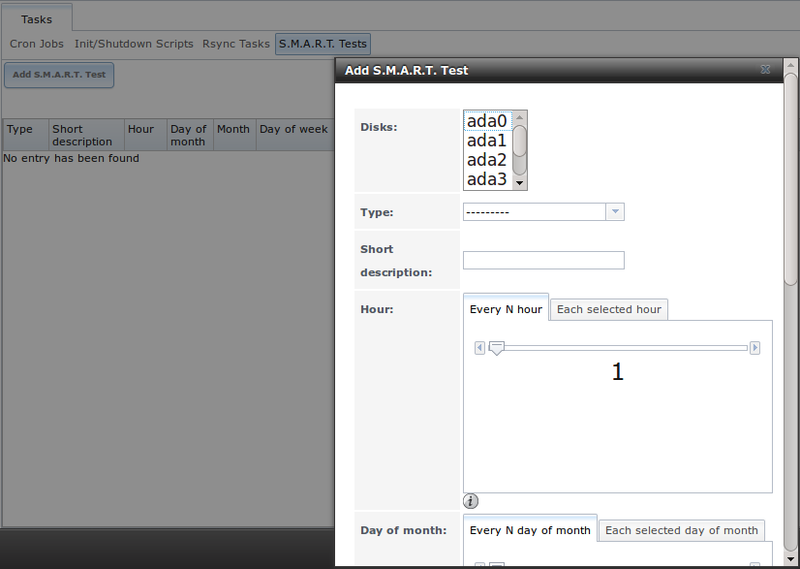 Figure 6.4a shows the configuration screen that appears when you click Tasks ‣ S.M.A.R.T. Tests ‣ Add S.M.A.R.T. Test. The tests that you create will be listed under “View S.M.A.R.T. Tests”. After creating your tests, check the configuration in Services ‣ S.M.A.R.T., then click the slider to “ON” for the S.M.A.R.T. service in Services ‣ Control Services. The S.M.A.R.T. service will not start if you have not created any volumes. to prevent problems, do not enable the S.M.A.R.T. service if your disks are controlled by a RAID controller as it is the job of the controller to monitor S.M.A.R.T. and mark drives as Predictive Failure when they trip. Table 6.4a summarizes the configurable options when creating a S.M.A.R.T. test. An example configuration is to schedule a “Short Self-Test” once a week and a “Long Self-Test” once a month. These tests should not have a performance impact, as the disks prioritize normal I/O over the tests. If a disk fails a test, even if the overall status is “Passed”, start to think about replacing that disk. take care when creating your test schedule as performance issues can occur when S.M.A.R.T. tests are run at the same time as scrub or resilver operations. You can verify which tests will run and when by typing smartd -q showtests within Shell. If you enter an email address in the “Email to report” field of Services ‣ S.M.A.R.T., the system will email the specified address when a test fails.